AzBaja.com, Home of the VW Baja Bug -:- Baja Forums -:- VW Volkswagen Bug, Baja, Bus, Sandrail and Thing -:- VW Volkswagen & Baja Bug General Discussion -:- LOOK WHAT I TRADED FOR!!! Baja Forums -:- VW Volkswagen Bug, Baja, Bus, Sandrail and Thing -:- VW Volkswagen & Baja Bug General Discussion -:- LOOK WHAT I TRADED FOR!!! LOOK WHAT I TRADED FOR!!! Post subject: LOOK WHAT I TRADED FOR!!! LET ME KNOW WHAT YOU GUYS THINK OF MY LATEST TRADE. I TRADED STRAIGT ACROSS MY BAJA FOR A FAMILY CRUISER. 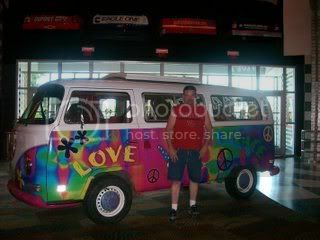 HA HA HA No I didnot trade.This bus is in a casino in vegas.I was looking at the trasmission. But they won't sell it. Post subject: Re: LOOK WHAT I TRADED FOR!!! LOL! Good thing you didn't! That bus has "Please pull me over & see what I'm smokin'" written all over it! Could make the trip from LV to QC take 2 or 3 days.